The Supreme Court today closed the contempt proceedings initiated against Kerala Chief Secretary Nalini Netto for delay in reinstatement of expelled Kerala DGP T P Senkumar after accepting her “unconditional apology”. The court also took note of the fact Senkumar has been reinstated. "Since the order has been implemented, nothing survives", a bench headed by Justice M B Lokur ruled. Netto had offered an “unconditional apology” on Monday. “I have the highest regard and respect for the orders of this Honourable Court and I have no intention to violate the same. I tender my unqualified apology for any aspect on my conduct which this Honourable Court construes not to be in accordance with its order,” Netto had said in a short affidavit. There was no “wilful default or disobedience” from her side. “I have acted expeditiously and according to legal advice, after duly consulting with the Advocate-General,” she submitted. Netto said a file was “opened” on April 26, 2017 — a day after the court judgment ordering the re-instatement of Senkumar — to initiate the process of implementing the judgment. The matter was sent to the Law Secretary for advice. The Law Secretary, under the instructions of the Chief Minister, had sought an opinion from the Advocate-General who, on May 1, suggested to file a modification application on the judgment and seek a review of the verdict. The affidavit said the Council of Ministers had met on May 3 and decided to wait for the outcome of the modification application. Pulling up Kerala government for the delay in re-appointing T P Senkumar as DGP despite its order on April 24, the Supreme Court had on May 5 refused to admit a plea filed by the state for a modification/clarification and imposed a cost of Rs 25,000. "We can impose cost even if you are withdrawing the petition", a bench headed by Justice Madan B Lokur had told senior lawyer Sidharth Luthra who appeared for the state and opposed imposition of the cost when the state was withdrawing the plea. 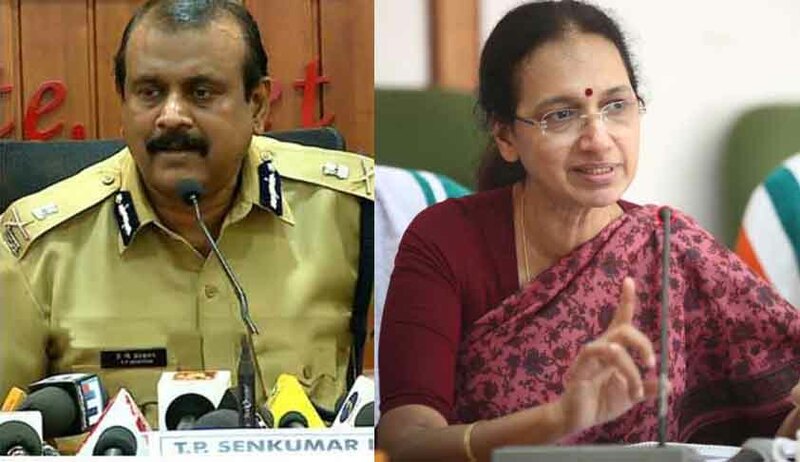 The bench then issued notice to the state on a contempt petition filed by Senkumar against Kerala Chief Secretary Nalini Netto for delaying his reinstatement as the State Police Chief as ordered by the Supreme Court. The Contempt Petition filed through Advocate Haris Beeran stated that the Petitioner wrote a communication dated 25.4.2017 to the Chief Secretary Nalini Netto to expeditiously carry out the directions of the Apex Court and to issue appropriate instructions regarding the same. “The intention of the Respondent Contemnor, who is the authority to issue orders of reinstatement, seems to delay the implementation wilfully so that the Petitioner will not get the fruits of the decree which he has got. The Contemnor is also conscious of the fact that once this Hon’ble Court closes for summer recess on 9th may 2017, it reopens only on 3rd July, 2017 which will make the Petitioner remediless and thus frustrate the judgment of this Hon’ble Court”,states the Petition. SC had concluded that Senkumar’s removal took place in a most arbitrary manner without following the established process of law Senior advocate Dushyant Dave, who appeared for the ousted DGP had argued that his removal from the post by Chief Minister Pinarayi Vijayan can only be related to his independent and thorough investigation into the political violence in the state in which several CPI(M) leaders had come under the probe and had nothing to do with his handling of Jisha murder case or Puttingal fire tragedy as alleged by the state government.